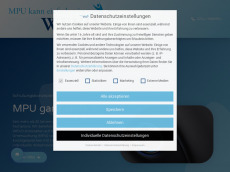 Test up to 1.000 webpages of mpu.de with our free plan! There are only 264 words on this page. Good pages should have about 1,000 words of useful content. 42.4% of the text are stop words. This website has backlinks from 125 referring domains. This website has 348 backlinks. This website has backlinks from 113 different ip addresses.